The new modular fiber optic thermometer FOTEMP Modular system offers maximum flexibility for all of your measurement projects and is suitable for applications which require a simultaneous readout of the measurement channels with high speed. The fiber optic thermometer consists of a 19″ case which provides place for up to 40 simultaneous channels in a total of 10 modules. Each module can be easily removed or replaced. One simply needs to remove the old module from the slot and insert the new one. We offer a variety of features e.g. 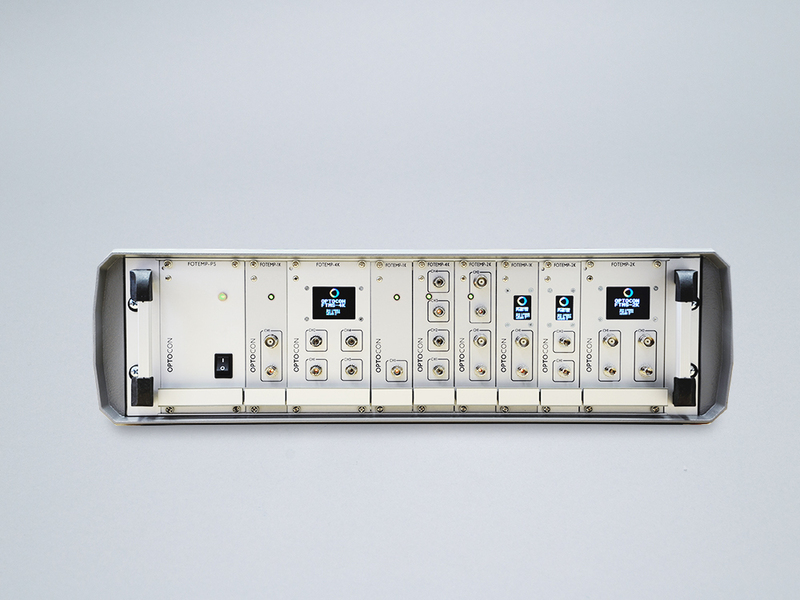 1-4 channels per module, additional analog outputs and display versions. The FOTEMP Modular system can be connected to the computer via a serial interface. Via the software Fotemp-Assistent all measurement results can be easily controlled and monitored via computer. The software features direct data logging and data saving to a Microsoft Excel spreadsheet. The fiber optic thermometer FOTEMP Modular system is especially adapted for industrial needs: among other things this includes low maintenance, robust components and the ability to withstand the toughest conditions, the system adapts perfectly to the most stringent environmental conditions with regard to shock, vibration, moisture and variations in pressure and temperature. All components of the fiber optic thermometer, such as the light source guarantee a long service life. The FOTEMP Modular system is compatible with all our fiber optic probes. The outer jacket of the fiber optic temperature sensors is made out of teflon, at the sensor tip a GaAs crystal (gallium arsenide) is attached. The probe sensor is completely non-conductive. Optocon’s fiber optic sensors offer complete immunity to RF and microwave radiation with high temperature operating capability, intrinsic safety, and non-invasive use. The probes are also designed to withstand harsh and corrosive environments. Data logging Supplied with FOTEMP-Assistant data logging software. Excel compatible output files. Calibration Intervals Under normal use, the instrument does not require recalilbration. When sensors and cables are changed, a One-Point Calibration is required. Recommended cal interval is 12 months for ISO systems. Contact Micronor to discuss your mutilichannel system requirements. On a cost per channel basis, the FOTEMP Compact Bench Top and FOTEMP-TRAFO DIN Rail Mount systems are the most cost-effective. FOTEMP-Modular system makes the most sense when either faster update rate (maximum 250ms) OR 8 or more channels is required.